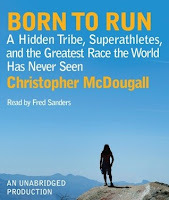 Born to Run is one of those books I saw on the library audiobook list, thought about borrowing, but for some reason or other didn't, that was until I read April's review over at Books and Wine. Sometimes I need that little push. McDougall goes in search of the mysterious Tarahumara Indian tribe in search of some answers about running. If the modern science of running has convinced millions of people to buy cushy shoes, why are there so many injuries? Shouldn't we all be super-athletes by now? How are these barefoot runners able to fly around canyons from the moment they learn to walk until they drop dead? McDougall dodges drug dealers, snakes, and the desert sun just to talk to them. Inadvertently, he discovers an American living like the Tarahumara, a man called Caballo Blanco. He tells McDougall a story of ultra-racers and the attempts of one man to make the Tarahumara runners a household name. Much later, Caballo Blanco reaches out to McDougall. He wants to pit the best runners in the US against the Tarahumara, not for big prizes, but for the love of running. I can't really explain Born to Run as well as I'd like to. That's a pretty sad synopsis. The reason is because Born to Run meanders all over the place: into the past, into science, into Africa and Mexico. Sometimes I would wonder how I got where I was in the story? "Wait, some guy is hunting deer in Africa now?" But I was always entertained. I also thought McDougall was pulling my leg at times. Some of the antics of the people in the story seem way out there. Also, there really can't be these nutters who would run 100 miles straight up a mountain for fun, can there? Yes, there are. Good gravy. What I found most interesting (and a bit more relateable) about Born to Run is the science behind the barefoot running movement. It seems like common sense that humans are meant to run barefoot. Evolution built us for it. Our ancestors had to run if they wanted to eat and they didn't have Nikes. I'm almost convinced, though those guys only lived to be about 35. Anyway, I did actually go out and buy a pair of Puma Faas 250. They're a minimalist shoe. I've only ran a couple of times in them but so far, so good. I'm never going to be an ultra-runner but I can pretend. Don't be put off by all the running. You don't have to be interested in that to get something out of the book. It's quite an adventure story too. About the audio: Fred Sanders is the narrator. He has a good storytelling voice and injects lots of enthusiasm into the story. I saw something on TV about this and thought it was very interesting. I wouldn't mind a book about it, so I am going to add it to the wish list. Thanks! I hate wearing shoes, so I'm all for barefoot running! The puma shoes sound cool. I need to seriously get new running shoes. Also, I think because my brain too, goes all over the place I was into that bit with the book. The barefoot movement is fascinating. Like, I had no idea that cushy sneakers were kind of a cause of running injuries.